Cities are getting more and more crowded with lots of people and many buildings that come in all shapes and sizes. 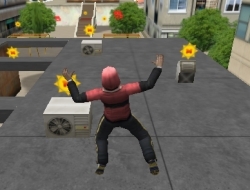 The feeling of freedom is really strong when you are able to run across the tops of the buildings and jump from one to another, even if it is only in this 3D running game. The adrenaline rush is very strong especially now that all your races are timed. The goal is to reach the end of each level after you have collected as many Miniclip markers as you can. Also there will be time bonuses available for you in the shapes of green clock symbols, and the red camera ones will allow you to do a special tricks and be filmed from all the angles giving you lots of points. Watch out for the timer and try to run fast so it will not run out while you are still trying to reach the end of the level marked with the red smoke. Use the arrow keys to run and X to jump and climb ledges. Free Running 8.00 between 0 and 10 based on 2 votes.